As we’ve seen, the starry sky has the appearance of a huge celestial sphere, with many correspondences to the spherical globe of the Earth. There is very much that one can say on this subject. During the heyday of classical astronomy, “The Doctrine of the Sphere” was the cornerstone of astronomical study. In essence, the starry sphere has North and South Poles and also an Equator. And the sky also has a system of positional coordinates, just like the Earth. On the Earth, we measure position on the globe by the coordinates of latitude and longitude. Latitude measures position from North to South. The Equator, being in the middle between the North and South Poles, is Zero degrees latitude. The North and South Poles themselves are at 90 degrees North and South respectively. Parallel circles of latitude lie between the poles and the Equator. A large percentage of the world’s population lives near the latitude of 40 degrees North. Many northern cities of the United States and southern cities of Europe lie within 10 degrees of the 40th parallel North. The very large population of China also lives within this range. In the sky, celestial positions are given in coordinates of “Declination” and “Right Ascension.” There are also parallel circles in the sky that correspond to the circles of latitude. These celestial circles are the parallels of Declination. We use declination to measure the positions from North to South of the Sun, Moon, planets and stars. Now here’s the interesting part — the circles of declination correspond exactly to the circles of latitude. That is to say, for any given circle of latitude, the respective circle of declination passes directly overhead in the sky, at the zenith. For example, since the Equator has a latitude of zero degrees, the Celestial Equator has a declination of zero degrees, and passes overhead at the Equator. It so happens that, in the well-known constellation Orion, the Belt of Orion lies along the Celestial Equator. As seen from the Equator, Orion’s Belt would pass directly overhead at the zenith. And at the Poles, the respective Celestial Poles pass through the zenith. So from the North Pole, the North Star Polaris would be seen directly overhead. So basically, the stars you see at the zenith depend on your latitude. This God-given fact makes it possible to find your latitude by the stars, thereby allowing all celestial navigation. If you are a navigator on a ship, you’re going to be very familiar with the stars and have tables handy of the declinations of all the stars. So if you see a certain star at the zenith, you can use that to know your latitude on the Earth. And instruments such as a sextant help you make precise measurements. These techniques of classical astronomy have been used for millennia. Preschool Science: Followup to the big CRAFT project! Well, we did it! And when I say we I mean my husband and the kids. Regardless, I wanted to post our amazing craft photo from the preparatory blog post last week. Remember, this is amazing because I AM NOT CRAFTY. So I bought the kit and my husband did the project with the kids. Cop out? Perhaps. But look at the amazing work! The kit had Pluto in it, which, as discussed before, is no longer a planet. It’s up there anyway. The kids love it hanging in their room, and it serves as an excellent capstone piece as we wrapped up the study of the 4th day of creation with Alpha Omega Horizons Preschool. 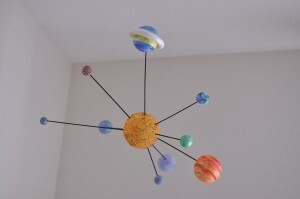 Any good solar system crafts you know of? Leave a comment and a link!